As we continue our series on the early history of Illinois, here’s a chance to read one of our old Local History Room columns, first published in January 2012 before the launch of this blog . . . Among the earliest written records of Illinois and Tazewell County history are found in the journals of the French explorer Rene-Robert Cavelier, Sieur de La Salle (1643-1687), who is best known in Tazewell County for building a fort at the future location of Creve Coeur in January of 1680. The Pekin Public Library’s Local History Room has resources that can help to bring that story to life. As we saw last time, the purpose of Fort Crevecoeur and the other forts the French built in the Illinois Country was to help France control the fur trade. The most likely place where this fort stood is in the low areas of Creve Coeur or possibly East Peoria, between Peoria Lake and the bluffs. Others have argued the fort was much further up the river, or far down river in the area near Beardstown, but neither of those locations fits La Salle’s description very well. In a 1902 essay, “Historic Pekin!,” Pekin’s early historian W. H. Bates tells how La Salle and his party “landed at what is now Wesley City, Pekin Township, five and a half miles due north from Pekin, and built a large stockade fort on the high bluff above which he named Creve Coeur. “ Wesley City later was renamed Creve Coeur in memory of La Salle’s fort, and until recently the community has looked back to those days every spring and fall with events at Fort Crevecouer Park. As for La Salle himself, he later founded a French colony on Garcitas Creek, Texas, on the Gulf of Mexico, but La Salle’s men mutinied and he was murdered by one of the mutineers on March 19, 1687, near modern Navasota, Texas. Rare, early maps of the area show both Lake Pimiteoui and Fort Crevecoeur, but not in enough detail to ascertain the precise location of the fort. One of the earliest of those maps was drawn up in 1688 by Jean-Baptiste Louis Franquelin, who had served as La Salle’s draftsman in France in 1684. Franquelin’s 1688 map was ultimately based on a lost map drawn up by La Salle himself. 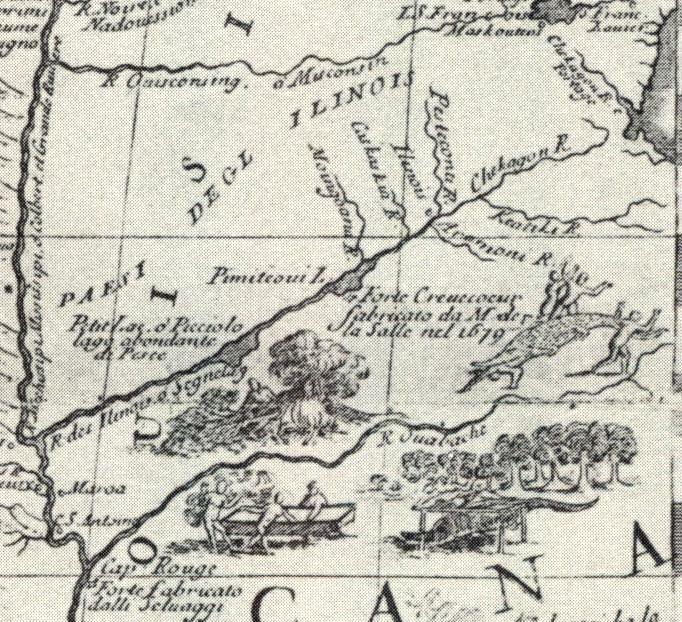 Fort Crevecoeur and Pimiteoui Lake are also noted on Marco Vincenzo Coronelli’s 1688 map of North America. 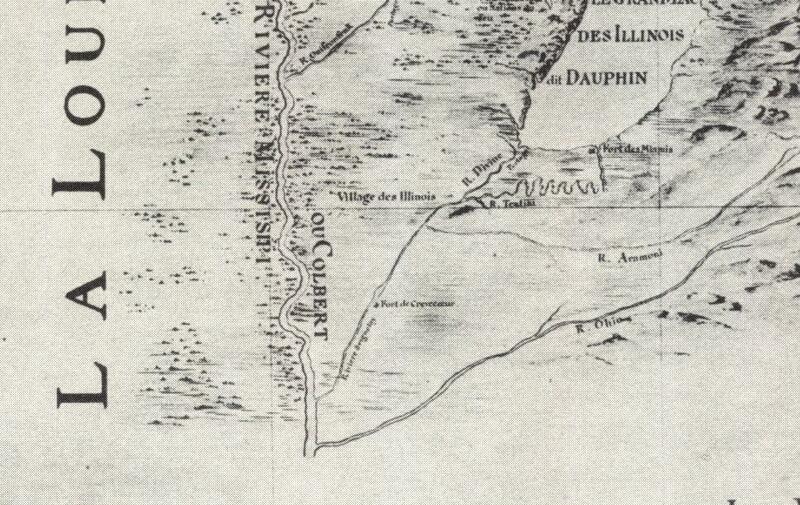 Coronelli got his information about Fort Crevecoeur from La Salle’s own 1682 Relation Officielle of his discovery of the mouth of the Mississippi River. Reproductions of these and other early maps of Illinois and North America are included in “Indian Villages of the Illinois Country,” a remarkable atlas kept on file in the library’s local history room. 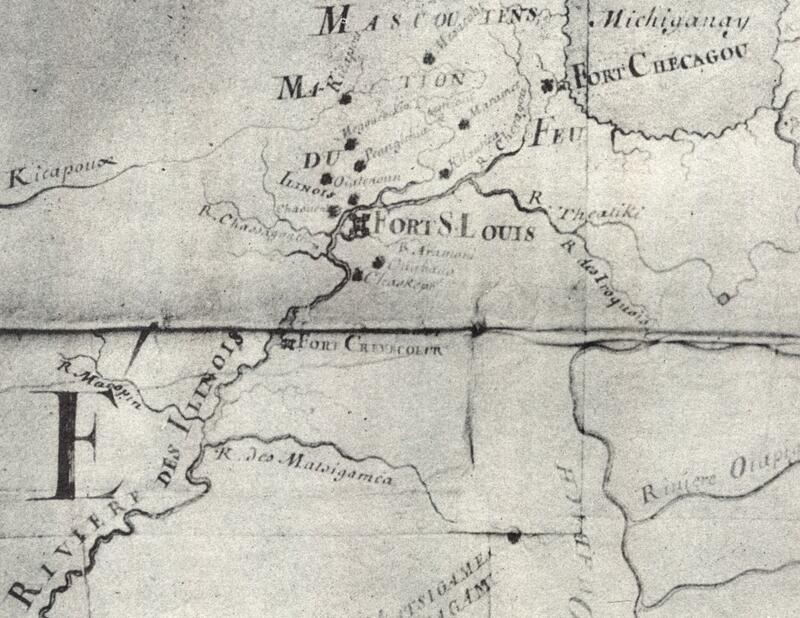 Fort Crevecoeur — also known as Fort de Crevecoeur — made its first appearance on a map in 1682, when the Abbe Claude Bernou drafted a map of the Americas. Shown here is a detail from Bernou’s map. Fort Crevecoeur is marked in this detail from a 1688 map by Jean-Baptiste Louis Franquelin. This was one of the first maps to show the ephemeral Fort Crevecoeur. Fort Crevecoeur is marked in this detail from a 1688 map by Marco Vincenzo Coronelli. 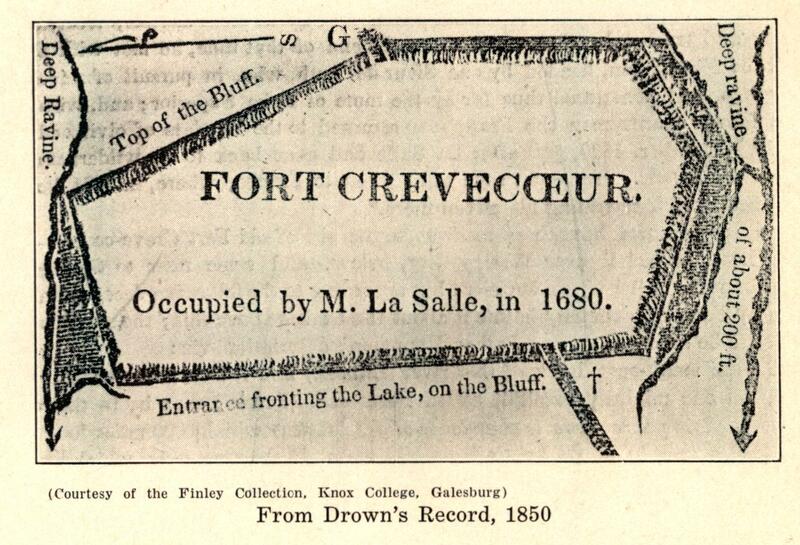 This was one of the first maps to show Fort Crevecoeur. As Illinois’ yearlong bicentennial celebrations commence this weekend, starting with this installment of “From the History Room” and continuing through the coming year we will direct a spotlight upon the history of our state, with a special focus on connections between Illinois’ early history and the history of Tazewell County and Pekin. The best place to begin the story of our state is at the beginning – not Dec. 3, 1818, when Illinois became a state, but in the 1600s, with the arrival of French explorers. The kingdom of France had laid claim to large parts of Canada and the lands through which the Mississippi River and its tributaries flowed, and in the latter decades of the 17th century the French began to explore Illinois – a country of wild and unbroken forests and prairies, before roads, dams, levees, cities, and powerlines. But, as we recalled last week, it was not an uninhabited land. Our state’s name, “Illinois,” is a French word. It comes from the name of the people living here when the French first began to explore this part of the world. The people were called the Illiniwek or Illini, also called the Inoka, who were a confederation of 12 or 13 Native American tribes who lived in an area of the Upper Mississippi River valley reaching from Iowa to Lake Michigan and as far south as Arkansas. When the French first encountered the Native Americans here, the Illiniwek confederation’s member tribes included the Kaskaskia, Cahokia, Peoria, Tamaroa, Michigamea, Moingwena, Coiracoentanon, Chinkoa, Espeminkia, Chepoussa, Maroa, and Tapourara. The names of the first three listed tribes are probably better remembered than the others. It is from the Kaskaskia tribe in southern Illinois that Illinois’ first capital, Kaskaskia in Randolph County, got its name. The name of the Cahokia tribe is remembered today because of the famous Cahokia Mounds in St. Clair County, which are the remains of a Native American city that existed from about A.D. 600 to 1400. The people of Cahokia Mounds were no doubt ancestors of or related to the Illiniwek tribes. The city and county of Peoria were named for the Peoria tribe, which lived along the west shores of the Illinois River at Lake Pimiteoui (Peoria Lake). 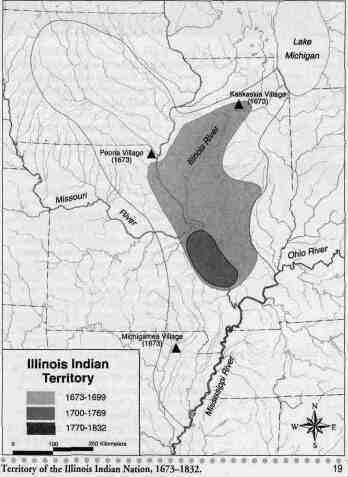 When French explorers and fur traders encountered the Illiniwek in the 1600s, they decided to call their land by the French term Pays de Illinois (land of the Illinois, or the Illinois Country). The French also sometimes referred to the Illinois Country as la Haute-Louisiane (Upper Louisiana). The names of the first French explorers of the Illinois Country are well known: Marquette and Jolliet, La Salle and Tonti. In 1673 and 1674, Father Jacques Marquette, a Catholic Jesuit priest, and Louis Jolliet explored the Illinois River and Mississippi River down to the Arkansas River. The city of Marquette Heights in Tazewell County and the Hotel Pere Marquette in Peoria are named after Father Marquette (Pere in French means “Father”). Some years later, on Jan. 15, 1680, two French explorers name René-Robert Cavelier, who had the French aristocratic title of Sieur de La Salle, and his companion Henri de Tonti established a small, short-lived outpost named Fort de Crèvecoeur or Fort Crèvecouer near the southeast shore of Peoria Lake in Pekin Township, in or near modern Creve Coeur or East Peoria. The arrival of the Europeans caused catastrophic disruptions in the way of life of the Native Americans. The Europeans unwittingly brought diseases that wiped out many Indian tribes, including most of the Illiniwek tribes. Off to the east, European newcomers pushed native tribes west in search of new hunting grounds, leading to war between tribes in competition for the same lands. But by the mid-1700s, European diseases and war with the expanding Iroquois League had reduced the Illiniwek to only five tribes: the Cahokia, Kaskaskia, Michigamea, Peoria, and Tamaroa. Next week we’ll recall the confusingly named French and Indian War.